MUSIC: Fleet Foxes are back (minus Father John Misty) and they're coming to Spokane. SFCC classes will move to this WSU building. 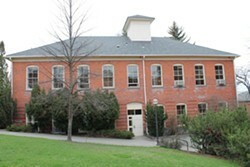 Community College will move onto Washington State University's campus next week, leaving its space at the Gladish Community Center in order to save on rent. MUSIC: Some big names across genres will hit the local stage as part of Northern Quest's 2017 summer concert schedule: Willie Nelson, Flo Rida, Alice Cooper, Toby Keith and more.